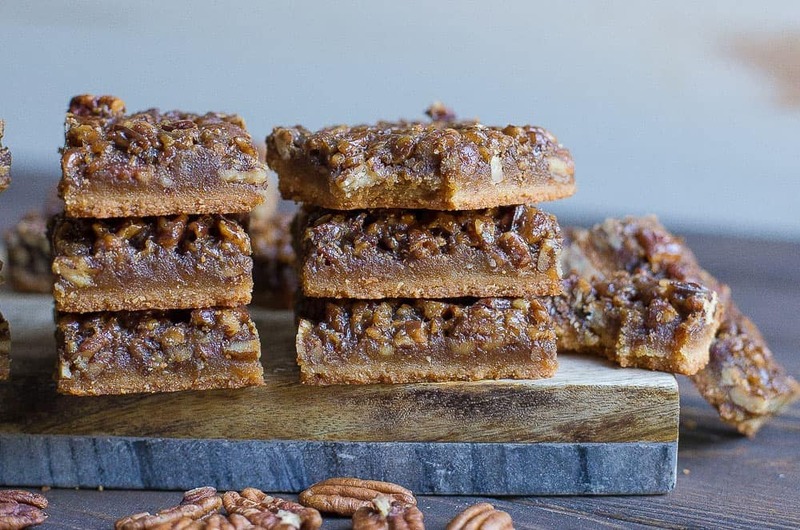 These Maple Pecan Shortbread Bars are sure to be loved by all!! 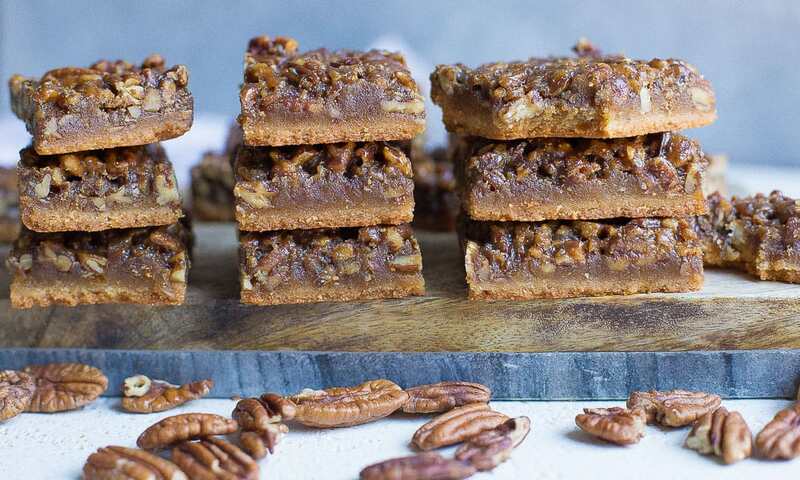 Tasting just like pecan pie in a square, without all the junk ingredients. 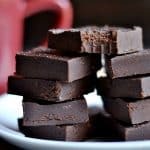 Paleo, Vegan, Gluten-Free, and absolutely delicious! 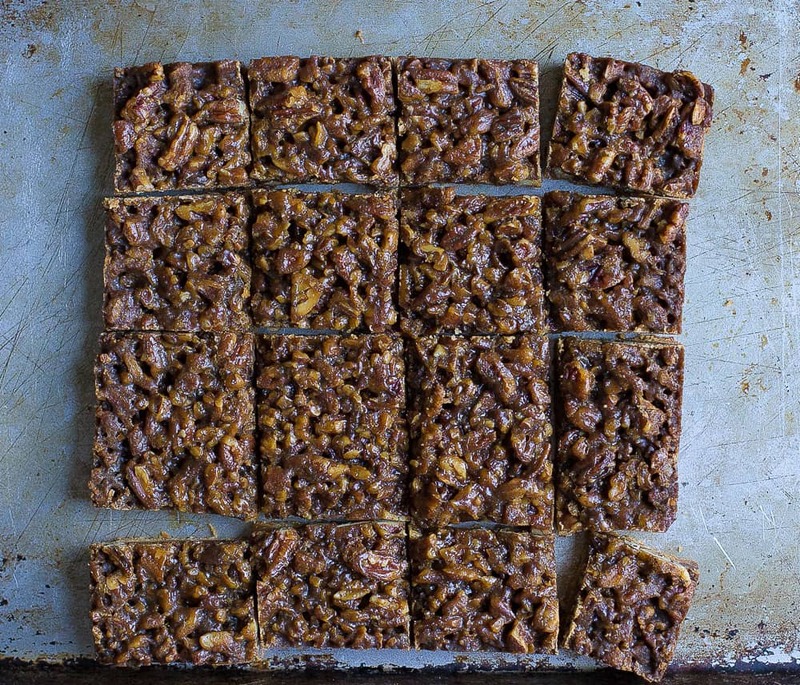 I want maple pecan everything in my life; one of my favorite fall combos! 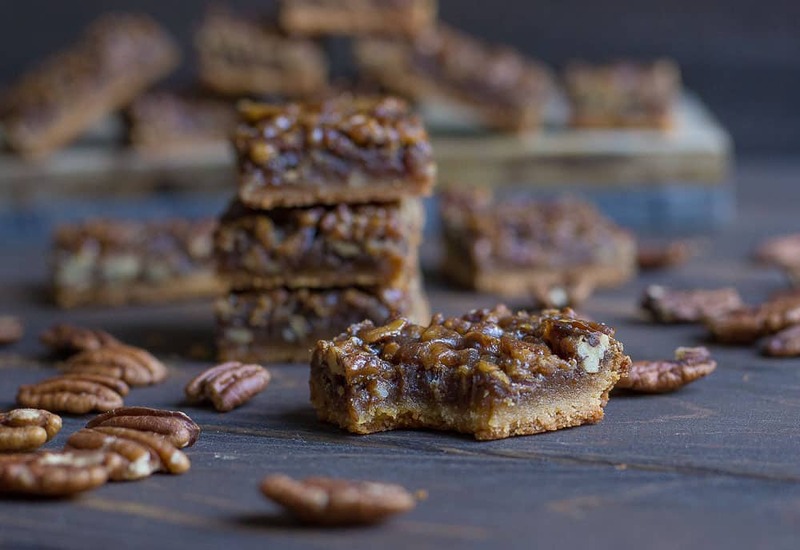 So can we just chat how this flavor combo makes the best pecan pie, and now, these shortbread squares? Squares seem to rock my little dessert world lately (I’m sure you lovely readers can tell). 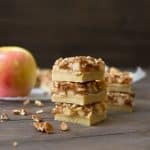 From my Apricot Bars to Apple Pie Bars, it all seems right. Something about a square pan, and square bars is just easier to me. AND…..if you want a fun packable dessert to take to share with others, THIS is what you make. I promise no one is disappointed! I discovered just how amazing pecan pie is without the corn syrup, when I tested my own variation using REAL maple syrup in it’s place (Paleo Pecan Pie coming soon!) It has a richer, nuttier, and earthier flavor without being overly sweet. I’ve infused maple syrup all over this recipe, and I know you’re just going to love it! The shortbread crust also has some maple syrup flavor, along with a buttery perfectly moist and yet chewy texture. 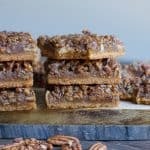 So if you’re in the mood for a little pecan pie, and are craving all the maple, you’re going to LOVE these!! 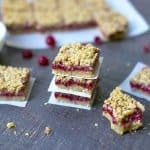 These easily can be a perfect dessert for Thanksgiving, or maybe as a treat during the holiday season. I also love the idea of whipping up a batch for a cookie exchange, or as a gift. No need to tell anyone they are grain-free, Paleo, and Vegan. No one will ever know! Preheat your oven to 350 degrees. Line an 8x8 pan with parchment paper and spray with a non-stick spray. Set aside. To make your crust, combine all crust ingredients into a food processor. Pulse until a dough like texture forms. Press the crust into the pan, evenly distributing. Place in the oven and bake for 12 mins. Set aside and cool. Leave oven on. To make the filling, in a medium saucepan, heat oil or ghee sugar, and maple syrup over medium low heat. Mixture should begin to bubble, let simmer for 2-3 minutes while whisking (careful not to let it burn). Set aside to cool, add vanilla. In a small bowl mix together water, flax seed, and arrowroot starch. Slowly stir into maple syrup mixture. Now add the pecans. Mix well, and pour on top of the cooled crust, spreading evenly. Bake for 27-30 minutes. Pull out of oven and let cool completely for at least a few hours (you can also add to the fridge to speed up the process). Cut into squares, can store in an air tight container for up to 1 week. *Ghee gives a more buttery taste, but is not Vegan. Use coconut oil for a Vegan recipe. In the ingredients list it says 1/2 coconut sugar; 1/2 of what? Also 1/3 of what for the coconut oil? It’s cup for both. Just converted all of my recipes to a new format, so some of the conversions didn’t go through. Sorry! Fixing the recipe when I get home. Can you suggest a substitute for the ground flax seed? 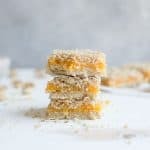 Would almond or coconut flour work? Thanks. Hi Stacy, could you do eggs? The flax seed is a binding agent that replaces eggs. SO you could do 1 egg and omit the water/flax seed. Thanks so much for your quick reply Amy. I made a double batch of these bars tonight with the egg as you suggested, and they turned out beautifully. So delicious. Thanks again! So if you don’t have flax, use an egg whisked with the arrowroot?